Whether you attended Three Women of Distinction or donated or did both, Eileen, Barbara, Anne and Rachel's Society of Israel Cancer Research Fund (which focuses on cancer's affecting women) we are most appreciative! It was a grand evening. The Three Women agreed to be honored because ICRF's work is meaningful to them and to those they love. 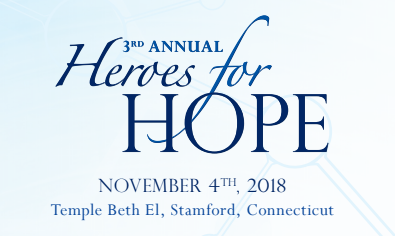 Funds raised that evening, and from other donations, allow ICRF to issue more grants for Israel cancer scientists to do their incredible research for all mankind. Last year ICRF CT Chapter raised enough funds ($55,000) for Rachel's Society to have a grant focused on women's cancers named in its honor. With your help, we should be able do that again! Thank you on behalf of ICRF and Three Women of Distinction....Eileen, Barbara, and Anne! Donate here. March 11, 2018 "Schvitz-a-Thon" at Stamford JCC" Details to follow. Monday, October 16 ~ 7:00 p.m.
Tamir Gilat, a successful businessman and lawyer (formerly goalkeeper for Maccabi professional soccer) was struck by cancer at 48 and told he had six months to live. Seven years later, Tamir savors each day, thanks to an experimental cancer drug, his doctor, luck and personal fortitude. Come hear his remarkable story! And hear about cancer research in Israel. "Nourishment for the Body, Mind and Soul"
Managing Director, Angelo, Gordon & Co.
Financial Services Sector breakfast event at Angelo-Gordon & Co.
Meet Professor Yossi Shiloh of Tel Aviv University. Meet ICRF Scientist ROTEM KARNI, Ph.D.
Join us for an Evening of Learning. No solicitation of funds. • Discovered the mechanism involved in breast cancer cell growth leading to early detection, treatment. • Identified a genetic protein likely to be involved in the development and spread of glioblastoma, the most common and aggressive type of brain cancer in adults. • Found a process in which cancer cells become resistant to certain drugs, leading to reliable prediction of which patients will most be helped by chemotherapy and which will not. He leads a team who focus on alternative RNA splicing and how splicing factors contribute to cancer development, tumor progression and the metastatic process. Your Jewish Genes and Cancer: What Should I Do? Rachel Barnett's "Your Jewish Genes and Cancer: What Should I Do?" Meet Dr. Yaqub Hanna on his Special Visit to Connecticut! The Israel Cancer Research Fund is the largest charitable organization in the US devoted to supporting cancer research in Israel. Since 1975, ICRF has provided 2,000+ grants totaling $50 million to outstanding cancer researchers whose laboratories are located in Israel's leading institutions. These scientists include the first Israelis to win the Nobel Prize in Chemistry. Funds go directly to scientists via a granting process. No funds go to bricks & mortar. If you would like to make a donation to ICRF, please click here. Rachel's Society: Your Jewish Genes and Cancer: What Should I Do? Program & Brunch Featuring Myron Arlen, M.D. Could the Answer to Cancer Come from Israel? Myron Arlen, MD has been involved in the surgery of advanced cancer problems and new therapeutic approaches. He established the Surgical Oncology Division at North Shore University Hospital, authored two major textbooks, and has published over 80 cancer-related journal articles. Dr. Arlen, a Trustee of ICRF, is the principal founder of Neogenix Oncology whose mission is to improve and extend the lives of cancer patients by developing innovative diagnostics and therapeutics that target tumors with precision. ICRF is the largest U.S. charitable organization dedicated solely to the funding of cancer research in Israel. ICRF has provided $50 Million to fund 2,000 individual projects at 21 different Israel universities, hospitals and research institutes. The results are remarkable: the development of three FDA-approved anti-cancer drugs. Two of ICRF's most distinguished scientists were the first Israelis to be awarded the Nobel Prize in Science.